yay dpt gk blik kg!1epy nk mampus..dh 3 bln melepak kt uia ni..njoy! !erm..lg pun exited nk tgok my new baby gurl..nuir damia auni..hehehe..ptg sok kot blah blik parit..erm..xsabarnye!! farisya ni jd tomboy pas ayah die meninggal..n mmg btol r watak tomboy dia ni menjadi..dia g minta keje jd driver tp xdpt..masa nk plah 2 ada mamaht terlanggar dia kt lift..berasap r si farisya..sampai dia kejar kot mamat 2 sbb kerek je x mintak maap..rupe2nya..mamat tu boss company..pas something dia dpt jd driver..mula driver je..last2 boss dia bleh jatuh cintan plak kt minah 2..pastu kawin..rupanye adik mamat tu xsuka minah 2..cm sial dorg wt jahat nk musnahkan idup minah 2..erm..mmg truk gk r minah 2 kene..ending dia? 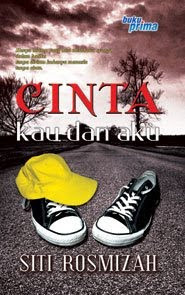 ?baca kasi habis..tp ak gerenti korg xkan nyesal(kalo y kaki novel la)..baca novel ni..g bli cepat2..k ...layan!! erm..ni la novel pertama y ak hbs baca dlm thn 2010..best kot..hahaha..sarcastic n penuh sindiran..kreatif n sarat dgn info n pengajaran..mmg agak lari dgn favourite ak tp cara penceritaan 2 mmg best tol..ak suggest korg baca r..erm..tp ada gk y kurang..plot dia cm kureng skit..dr awal ke klimaks best..cuma peleraian(kalo xsilap r..dh lupa the term)...cm cepat sgt..bleh kata cm nk cepat hbs la..tp 2 bg ak la..overall ak suka novel ni..ada masa baca r..erm nk kasi preview r kalo sape2 y xpernah baca..
i dunno wt happen actually..perhaps after done reading 2 novels..my mind was thinking about sm1..sm1 that hd changed my life a lot...erm...kinda shocked when there is a almost-same character in both novels who are almost-reflect sm1 that i really love..erm..
who is the person..sm of my fren know bout the person(easy to refer as A)..they said i was stupid to in love and believing the person(i agree so)..but yet..i still cant 4get or get angry to A(like sm other my frens did so)..erm..
why i cant 4get A..yup..A had messing up down my life twisting my day by 180 degree and make my world uncertainty but..behind that..A had gave a new life..A pulled me out fr the darkness..A proved me that world is not that bad..A gave me confidence to strive in trouble..A like everything 4 me...and ya..my frens said A jz want to have fun..is A thinking like that?? i was left without answer..no chance to meet A..technologies made us closer(still the invisible gap was so big)..ya..my soul is not happy wif that..i'm suffered but lucky the smile is still here...when the time comes..i was so down..alone..so lonely..i used to have A to help me...but...now..i'm alone looking 4 the light to bright my world..the rope to pull me out..erm...i live in my own imagination..
i was there at 415 mybe n few of us were there set up the fire...d evening was windy n cloudy..jz nice 4 this activity..smmore near the lake(gosh..lucky the air wasn't smell like usual)hehehe..
many topics hd been discussed wif some 'auta' scandal n gossip..overall it was so great..mini event but yet full of fun n joy..yup..the last part..the continues issue with regard of marriage was a joke that i'll never forget..1 of superb jokes in my life..n ya..some 18SX double meaning joke..hahaha..
looking 4ward for more activity!!! !keep in touch! dh kul 1am..plan nk update smpai ari ni tp cm ngantuk plak..ak try r..k la..y dh baca tq la 4 ur time..komen jgn x komen..so far ak jz tulis my experience je r..but by time i try 2 improve the info n context so we could gain gud knowledge here...hehehe..
lg 1 y best ntah cmne dorg drive bleh jatuh num plat van tu..gle tabah r team uia..cm rombongan cik kiah ke kl plak..1 kete len saiz kelisa tp y naik thp rhino n elephant(sory kak t*** n kak **a)gurauan je...motipnye..walo apun ringtangan..team tkd uia ready nk kasi gegar dunia!!YAY!!! p/s:sape naik kete ak je y selesa..erm...sian tgok dorg..hopefully next time g naik bus sama2..bleh berlatih vokal sambil menyeru hujan..